W: Oh, it is so nice to meet you! Do you have facebook? C: no. I am sorry. W: Do you have MSN? C: yea, but I seldom use that, so sorry. W: So maybe email is the best way to contact you? How can we be in the same social network with Chinese people? Or how can we contact our Chinese friends? Comparing with the fast development of the world widely social networking, email is even slower to us. 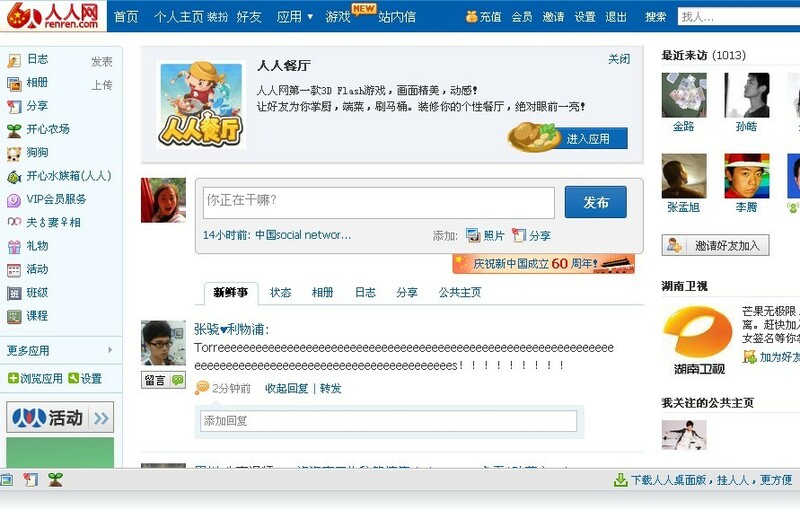 Most of Chinese don’t have facebook, and they seldom use MSN, however, they lead a happy life in their cyber world. Facebook is not popular in China (especially these days it is blocked), but Chinese people have Xiaonei and Kaixin. Although MSN is having a larger popularity now, QQ, the largest social network in China, can help people contact each other easily through its instant messenger client. There is no doubt that Chinese social networking websites are kind of copies of the worldwide social networking website, but we can also say that the features that western social networking demonstrates provide big help for the development of the whole Chinese cyber world, and also for the appearance of “made in China” social network. According to a study carried out by CR-Nielsen from 1st December till 28th December in the year of 2008, in the top 10 best social networking sites in China(except QQ), only three of them: Myspace.cn(ranks5), 360quan.com(ranks9)and Cyworld.com.cn(ranks 10) are from countries outside China. Xiaonei(literally named ”on-campus network” in Chinese), a social networking website for Chinese University students since the end of 2005, already has more than 15 million users. The appearance and feeling are nearly the same as facebook. People who use Xiaonei are almost university students. Users use their real names and attach their information of schools they have studied in, so that there will come out a long name list of the classmates and schoolmates who they might know. Since I entered the university in 2005, the development of Xiaonei was so fast and became popular all over China. I could even find some friends from primary school who I have lost the contact for even 10 years through it. However, there were only a few people heard of facebook before the appearance of Xiaonei, which also leads the success of Xiaonei among young people. Kaixin((literally named ”Happy Net” in Chinese) launched in 2008,in fact it followed and copied Xiaonei’s success. The difference is that purpose users in Kaixin not only limited in university students but everyone. So that all Chinese netizens could live a life as westerners now—they have their own “facebook” to communicate. It is not hard to find that there is a large number of researches showing that QQ (full name “Tencent QQ”) has won a big profit from 1998, the year when it was founded. In the beginning, there was only one function as chatting. Partly following MSN chatting, netizens apply for numbers to sign in and sign up. The sign of QQ is an adorable penguin, which make it quite easy to be recognized and advertised immediately. With the large usage of QQ chatting tool, QQ began to develop more in the next few years. We can say that QQ has absorbed the soul of MSN and another popular world wide chatting tool ICQ to improve itself in different areas. There are more and more functions continuing to be attached with QQ. For example: QQ zone. QQ zone is like”Myspace”, personal blog. However, QQ zone specially take care of those people who don’t know how to customize or don’t want to spend time on customizing their pages, they have beautiful customized things already, and what users to do is just choose. Generally speaking, QQ is just like a big mixture. Besides all the popular social networking functions, recently, because of the success of Xiaonei and Kaixin, QQ also begin to develop real name function for people to find classmates and even choosing the “idol” through pictures and blogs people put on QQ zone. Right now, there are about 300milliion Chinese using QQ. QQ penguin is everywhere. Baidu is the most popular searching engine in the mainland of China. Baidu Tieba,(literally named ”Baidu Poster Bars”in Chinese) is a communication board attached to Baidu itself. Back to the start, first Chinese social networking communications were set up as BBS(Bulletin Board Systems). It was a very simple community for people to sign up and follow the topic. BBS is a topic-centric platform. In BBS, people go there because they are interested in topics, and whom they communicate with does not really matter. Baidu Tieba is a special outcome of the development of BBS and Social network sites in China. Baidu labels it as “the biggest Chinese community over the global”. The features lie in an easy access. Baitu Tieba is divided into different discussion boards, the topic is everything, it could be a name, a pop star, a noun, a historic story etc. No one needs to sign up, if people want to show their opinions, they could just type out directly without any procedure. If there is no topic related, people can create a new entry. Allegedly, people have been created more than 1200 thousands topics, every day there are more than 350 thousands netizens visit Baidu Tieba. If you are interested in one of the topic, you can apply for being the member. Member system makes each topic become a social networking community. Because its easy participating, Baidu Tieba even becomes a place for people to communicate with celebrities in related topic discussion board, and to acquire the latest news among people’s discussion. What does the Isolation bring about? It is obviously that Chinese internal social networking websites creates an invisible isolation, which isolate China from the globe. The disadvantage it brings outweighs its good side. Isolation brings different values. I once worked in an international youth hostel in Beijing, guests there were almost come from everywhere of the world. They love China, but they also complain about something they don’t like. One thing they can’t figure out is the mind of Chinese people. We can explain that China has five thousand years of history, which make it possible that the cultural shock is seriously. However, in a widely open information era, it can be found that the Chinese internal social networking leads another thinking way for Chinese people. Especially in Baidu Tieba, because of the easy participation, big loads of information from everywhere cannot be dealt properly. The comparatively free environment of Baidu Tieba enables misleading information influences young netizens to some extent. A lot of popular new words come out, a lot of new views come out, the way people interact in fact lessens freedom. In this May, before the anniversary date of Tian’anmen Square protest in 1989, Chinese government blocked all the university discussion boards in Baidu Tieba, in order to make sure no students could talk what they want to talk. Isolation is changing the attitude of Chinese people. Losing contact with global social networking is in some way closed the whole country, it is not enough for Chinese citizens only get news from media. Arrogance begins to follow China five thousand years ago, in an objective view, an isolated social networking environment makes it even worse. Do Chinese people feel satisfied with their social networking life? I have to say a lot of Chinese young people want to get into a global social network, they try to invent or find proxy to break Chinese government’s control to use facebook, youtube etc. While I was signing up in the Ning.net for the masters of media webpage, I suddenly find I have already joined a social network “Beijing Stuff”. I have never realized that Beijing Stuff is a part of network of Ning before. Beijing Stuff is a social network for people who live, love or study in Beijing to communicate. People in this network are almost Beijing local people and foreigners who study or work in Beijing. It is in English, which offers an open platform for people from different countries to contact. Here I want to mention that “city” social network is a trend in Chinese social network. People create it in a website like Ning, and then invite people who are interested in that city. Besides using proxies, Chinese people can use this way to communicate with the whole world by this way. As far as I know, big cities in China already set up this social network, like “Shanghai Stuff”, “Guangzhou Stuff”. These “stuff” is indeed a good way for Chinese people to learn news from westerners who register there, and for westerners to understand Chinese culture more easily. Thnx for these insides into Chinese SNS Cici. It is not only China btw that is using other SNSs. Portuguese speaking countries like Portugal and Brazil are using H5, in Holland; Hyves is the most popular SNS. These countries don’t have any limitations in their Internet use. So compared to China, Facebook is not blocked there. Still the ‘local’ SNSs are preferred over worldwide social networks. What do you think it is that makes QQ more popular then other world wide SNSs? Personally I have the idea that language is still a barrier. Another factor could be that the SNS that is introduced in a certain country as the first SNS has the advantage above another; the change of finding all your friends is probably the greatest on the first SNS. Yup, you are right, the language barrier is the biggest problem for Chinese people to get to know this world. QQ is popular is probably because Chinese people have never get touched with other SNS before, since those SNS are all English or other language. I am not sure whether QQ is the first chatting tool in China,but besides it breaks the language barrier, it still has some functions that fits Chinese people. Like once you sign in QQ chatting ,you can get into all the popular SNS. QQ follows the speed of update of the world and China’s website. When xiaonei becomes popular,QQ attached a students SNS so soon in order to attract people who use QQ,when some computer games that are popular in Xiaonei and Kaixin, QQ updated it self with those games as well.So that it is so convient. Chinese is a human nation that wants everything to be simple and easy,they are sort of hate troubles. 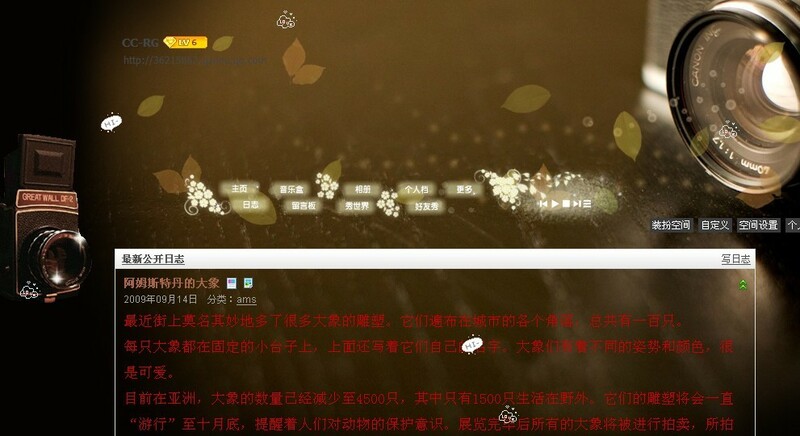 QQ offer Chinese a easy way to use SNS.